I am building quite a large L-shaped desk that will double as a housing unit on top for my computer components (instead of a standard case). I want to put a see through material on top so I can outfit the boxed area with LEDs but I do not know what material would be best. Someone recommended Tempered Glass but that can be expensive especially for the size I need, 5' x 1.5' and another 5.5' x 2'. 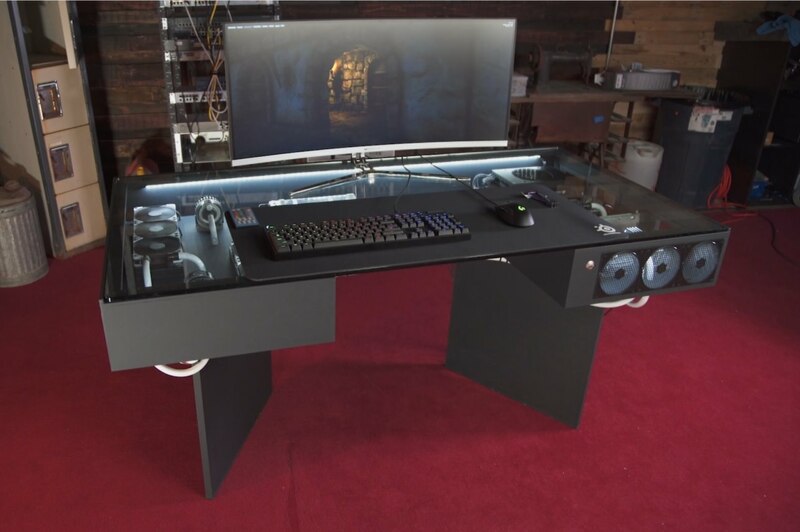 An alternative I have seen is Acrylic Sheets or Plexiglass however as I will want to have computer monitors and T.V.s on the top would weight be an issue? Also because there will be multiple computer components inside the top portion of the desk would possible heat distortion happen with either acrylic or plexiglass? This is one of those situations where no matter what the clear material you'd like to resist heat and everyday usage, you'll still be spending some money for quality material. I say this because the cheaper plexi-glass such as the regular acrylic based materials are inexpensive, but they can easily yellow over time and are very thin, not to mention them being susceptible to heat and scratches. We carry a product by GE called Lexan at your local store that is a tougher version of plexi-glass in polycarbonate form. But, if you compare pricing vs. tempered glass, it's about as pricey if you have it custom made. I'm not even mentioning if you beveled the edges either, which is something only a glass shop can perform professionally. That's not to say you can't do it; but given the skill, time, and money put into it, it would be easier to have a glass shop do the work for you. However, if using a sheet of Lexan without a bevel can be done based on your uploaded image, then its possible to do so as long as you have adequate supports in the middle of the glass so as to support the weight. All glasses and polycarbonate sheets we sell can't hold that much weight for the size you requested without some form of support in the middle and/or edge areas. If you factor that in, however, the Lexan can work as a plausible option.